Born in Denmark 1978, I write and directed television shows for kids. I have a set of twins and not much time for anything. 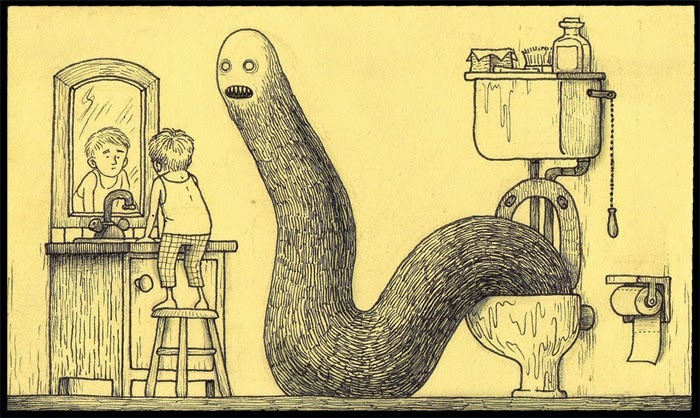 But when I have time, I draw monster drawings on Post-it Notes... It is a little window into a different world, made on office supplies. That's right, Post-It Notes. I first saw the artist's work a couple years ago, promoted along the lines of "You Won't Believe What This Amazing Artist Draws on Post-Its!!!!!" Luckily, the link had an image with it, so I got a glimpse of an eye of a Kenn-brand monster. It was big and fuzzy, and its gaping, toothy mouth and pale, sightless eyes struck the perfect chord of endearing, mysterious, and deeply creepy. The artist's use of ink on paper allows him to be extremely detailed. Thus many of his monsters sport shaggy pelts, tattered robes, or oozing, melted skin. This along with hyper-detailed backdrops of trees, fences. or bedroom walls makes the spaces left vacant pop. For example, the white eyes of his creatures, ringed heavily with black. A thing I love about these drawings is their atmosphere. 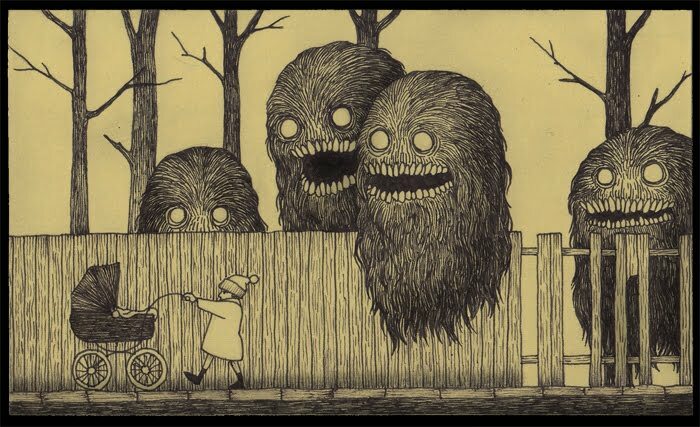 If there's an heir to the Edward Gorey throne, I can think of no better fit than John Kenn Mortensen. His pictures do encapsulate little worlds. Worlds that ring with the strangeness of childhood daydreams and imaginary friends. Worlds where the Wild Things Are. 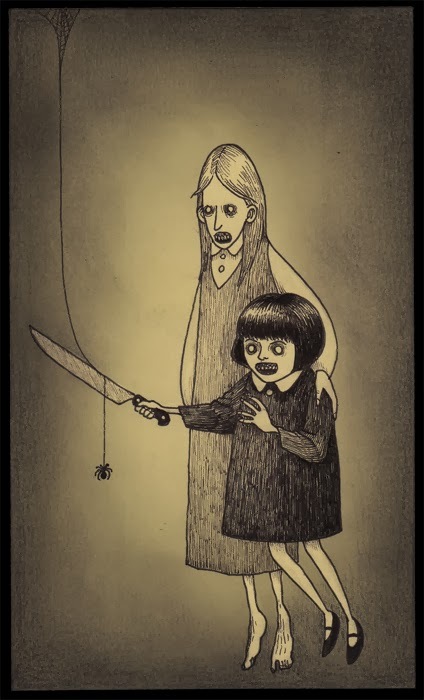 Worlds that house the creepy-crawlies kids innocently doodle, only to have their parent discretely crumple up the drawing as chills run down their spine. Monsters are lit against the night with glowing eyes, or slither from shaded closets. Sometimes the atmosphere is wrought with irised-in shading, other times it is in how lonely the monsters look. Further, there's a deeply Victorian part of me that loves miniatures. The fact that this work is done on Post-Its isn't kitschy; it feels like a 21st Century update to locket-bound portraits. 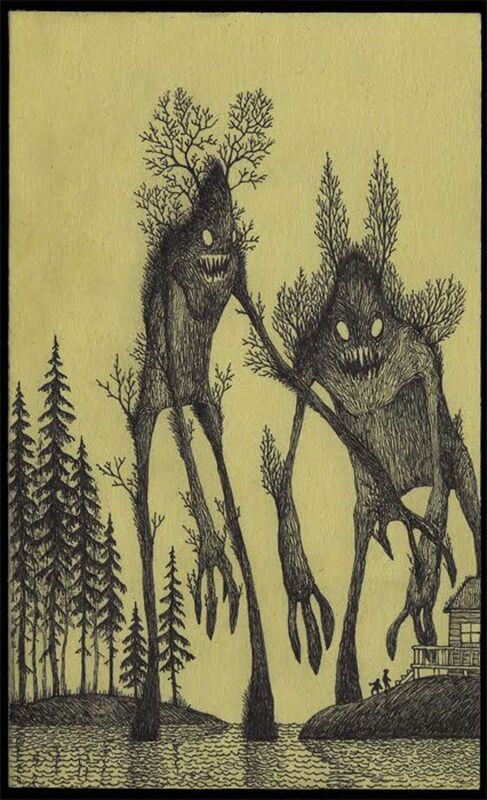 The only thing that makes me sad about John Kenn Mortensen is that sometimes it feels as though his fame is leveraged more on the Post-It Note gimmick than on the sheer mind-blowing quality of his work. I wonder whether he would have achieved viral-level exposure of his work if it were pencil on vellum. I wonder how many other Mortensens are out there making mind-blowing monsters I'm not looking at, just because they haven't figured out or bought into the right gimmick. But, at least this artist is doing well. Check out his website, or buy his books "Sticky Monsters" and "More Sticky Monsters". I know what I'm putting on my Amazon wishlist for next Christmas.